This is my favorite forecast. We posted it on our refrigerator many moons ago, but it works most of the time, especially out here in the Sunset district. 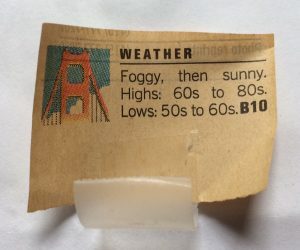 I do remember growing up how dreary the fog could be, especially day after day if it happened during the school year, but especially during the summer. The fog usually starts in ernest after July 1. But now that I’m older, I look forward to foggy mornings with some sun in the afternoon. I especially like the afternoon breeze and the wisps of fog making their way up the slope of the avenues. On some days the fog inverts itself. The beach is in clear sunshine and the fog condenses at about 350 feet, meaning that it forms on a line roughly at 28th Avenue. That’s pretty weird, but it’s cool to see it happening.